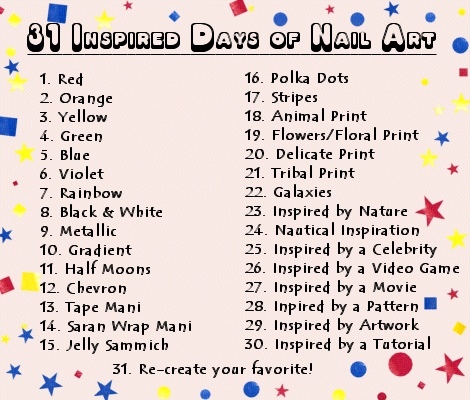 31 Inspired Days of Nail Art, Day 8: Black and White | Polish Me, Please! Paint your nails white, I used ChG White on White. It’s my go-to white polish. 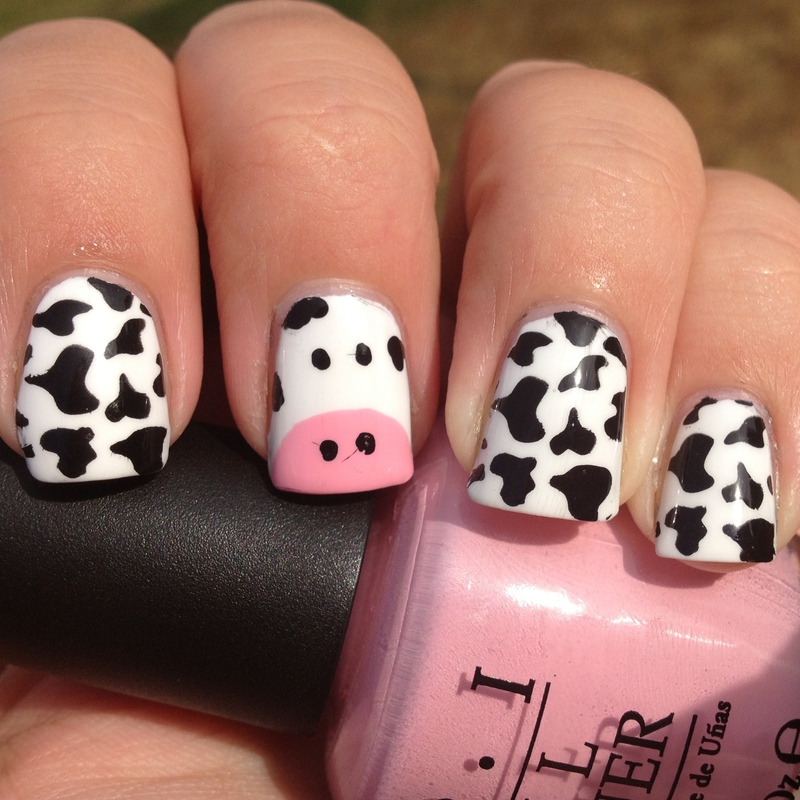 Use stamp BM 222 and Konad special black polish to stamp the cow design on ever nail but the accent nail. Use OPI Pink Friday to paint a half-circle at the bottom of your accent nail for the nose. Add some dots for nostrils and eyes in black. Put a few dots together to make an irregular shaped black mark in a couple of places to make the sparse cow print on your cow’s face. Give all your nails a little drying time, them top coat those bad boys. You know I use Seche Vite. Ahhhhhh its just SO cute!!!!!!!! Reminds me of Ben & Jerrys a bit (good thing). OMG! LOVE! This is kind of close to my heart because in high school my friends used to call me a cow. It’s not what it sounds like! It was originally because I ate spinach salad at lunch a lot and because it was funny because I was small. For YEARS I’ve gotten cow stuffed animals, ornaments, etc. I wish I was still that small, haha, but the nickname does still re-surface from time to time! That sounded HORRIBLE!!! “This is close to my heart because my friends used to call me a cow” WHAT?!?!? hahahaha. I think I kinda get it but that still just sounds terrible. I’m glad you liked these nails tho. You should do them yourself and send your old friends pictures of them! You don’t really have to have the stamp- you could just use some sort of dotter to make irregular shaped blobs for the spots! And the face is superduper easy. I don’t know if you remember, but a while back I did those posts and talked about the teen named Bubba…? Anyway, he is OBSESSED with cows too. I guess it doesn’t really matter but I just tought I’d let you know. Haha. Ahahaha…Bubba is such a kick in the pants! Do you think you’ll see him at the program again next summer? You totally should!! It would be so funny and probably bring up some fun HS stories. 🙂 That’s cool you still have your HS friends!! I don’t really hang out with anyone from highschool. I still talk to a couple occasionally via FB or text or sometimes phone but I don’t hang out with any of them much. I just like feet. I do not know why. This is soooo cute!!! 😀 I love the face!! I literally was going to do these exact nails for this day!!!! No lie, I think I even tweeted “cows or pandas” Majority of my follwers came back with pandas, so we can thank them!!! Although it would have been interesting to see both of ours together!!! I think yours would have been ten times better!!! So cute, love them!!!! Uh no. Hell to the no, freehand queen. Yours would probably be much better. 🙂 I love your pandas tho. They are sooo cute! I’m glad you like mine too. Thanks! I’m getting bad with commenting since I like everything on Instagram first, but then forget that I never actually saw the post. I’m sure I already expressed how much I love these! I think this mani came out super deluxe cute. Super deluxe cute? I love it!! 🙂 Thank you! You had cow socks?? That’s awesome!! I doubt they were calling you a cow! Only Lesley has to live w THAT nickname! Haha.